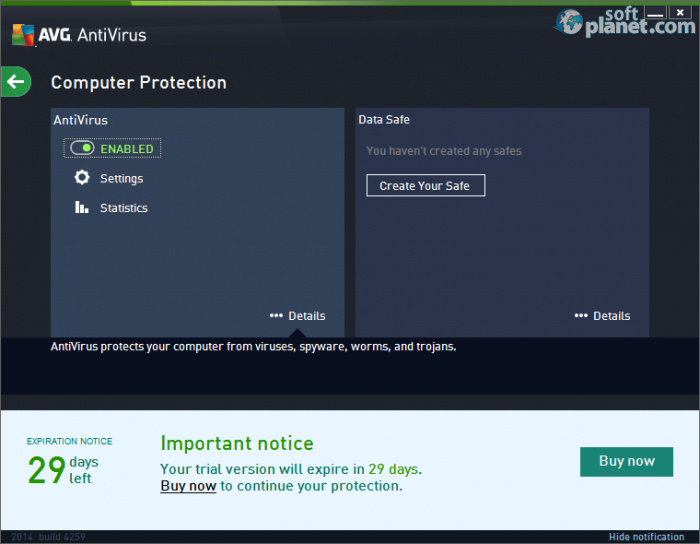 SoftPlanet makes it possible for everyone to get free AVG AntiVirus download directly from our servers. There is no registration needed for downloading. Nowadays AVG is one of the leading software companies, when it comes to developing security solutions for home and business users. It offers to its clients a proper variety of protection alternatives according to all kinds of users. 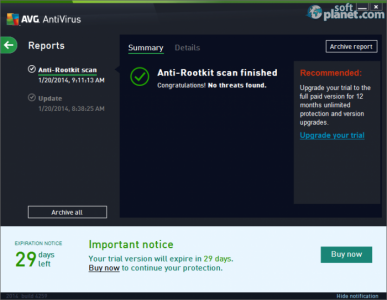 The solution we are about to review in the several paragraphs below is AVG AntiVirus . Please be aware that this particular version is shareware, unlike its smaller sister AVG AntiVirus FREE. 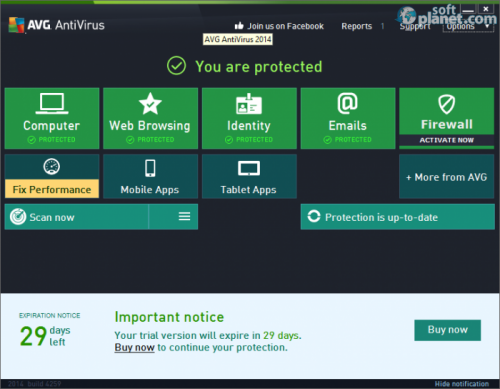 As you can see from the list above, AVG AntiVirus 2015.0.5941 comes with more advanced PC security compared to its free version, which has Antivirus protection, Link Protection and File Shredder. Choosing AVG AntiVirus , you get a complete protection package, which ensures that your PC and your private data will be secured no matter what threat attacks them. Beside all common security features like antivirus, antimalware, antirootkit protection, etc. this product is capable of providing you with a few more options as well. For example, when you decide to download files from the Internet, you cannot be sure whether they are safe or not. Thus AVG AntiVirus checks each link or file you are about to get on your PC thanks to AVG Online Shield. Purchasing this product automatically provides you with free protection for your mobile device. So you can secure all your gates where you access the Internet from. 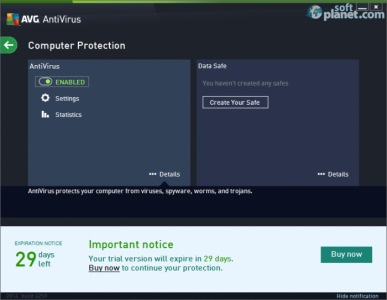 AVG AntiVirus comes with the exactly the same GUI like its free release. It is very user-friendly. It is mostly due to its well-organized outfit and tile-like feature buttons, which assure you quick access to each functionality available. All transitions are very smooth, without any delay at all. 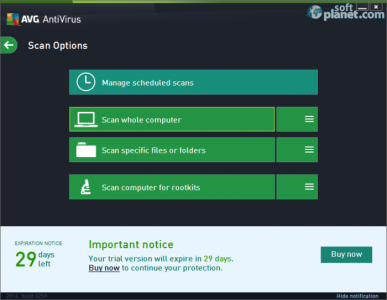 There is a single dropdown menu, which basically provides you with access to software advanced settings, Virus Vault, Update function and several other functions. Basically, AVG managed to keep their product very simple, but in meantime very classy and functional. As we already mentioned above, the well-structured interface provides you with almost instant access to program features, which makes its workflow very user-friendly. Most functionalities are automated in order to ease users. However you can still take your part if you want to. For instance, you are able to determine the scanning location or simply adjust the product settings just the way you want them. However we strongly recommend that you use the default software configuration, unless you have some advanced computing knowledge. 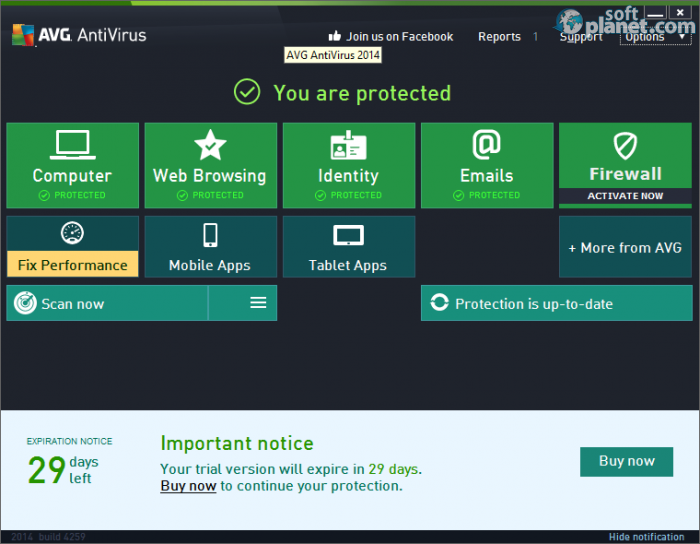 AVG AntiVirus 2015.0.5941 is just a great software alternative for protecting your personal virtual world. You can purchase it for only $39.99. This software product seems to be the ultimate alternative for the home user. Please don't hesitate to try it and share your observations with our team. Our security scan shows that AVG AntiVirus is clean from viruses. The current version of AVG AntiVirus has been scanned by our system, which contains 46 different anti-virus algorithms. 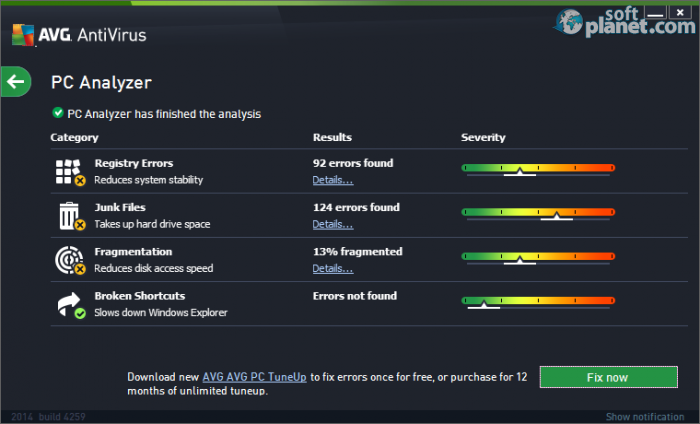 That ensures that AVG AntiVirus 2015.0.5941 is 100% safe for your computer.